Not a whole lot to say on this. Yay, you made it here from Barb's blog. We were asked to prepare something from the mini catalog for one of the upcoming holidays. I thought I'd use the Holiday Stocking Die. Above is what you might think of when you see this die, the traditional stocking. 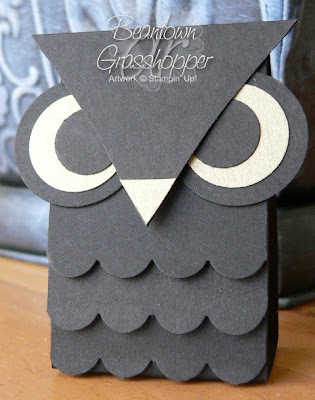 Cute and fun and endless possibilities with papers and embossing folders. Misc. 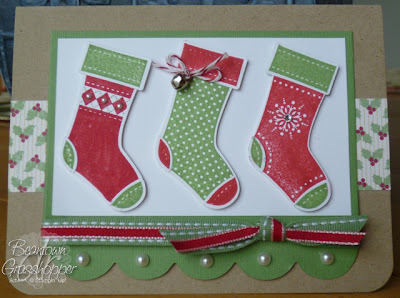 : Holiday Stocking Die, Stocking Accents Die, Glimmer Brights brads. What I thought of was this baby booty. Nice to be able to use this die for something other than Christmas. I made the stocking and the booty as a card. So, it doesn't have anything to do with a holiday but I wanted to share it anyway and tossed in another option for the die after this. I caved! I have avoided owls for the past couple of years as they became popular. They make me think of the 70's when they were over-done in home decorating. My mother even had a macrame owl that she made that hung on a door. I happened across this blog entry and thought it was pretty darn cute and had to make it. I really like theirs with the glitter but I didn't want the glitter all over the kids when they get them so I stuck with the gold paper. How cut is this? I love this card. I had 3 different ribbons on it and none of them were working for me and then I remembered that I had some Wild Wasabi that was retired a while ago and it is perfect with the stitching to coordinate with the stockings. Yay!! I went out to the ranch yesterday to teach the Communications merit badge to two different groups of scouts. We had a lot of rain this weekend and it was raining hard when I went. One of the leaders joked with the boys when I got there asking what troop slept in the lake. Apparently their tent leaked and they had several inches of water in it. That must have been miserable but they seemed to be in good spirits. They decided to cancel the activity and reschedule due to the rain and three of the merit badges having to be canceled. This meant I had 4 extra hours to my day and I used it to make a couple of cards. Today I'm sharing one that I copied from the current issue of Paper Crafts (p. 49). The original creator of the card used a color or two from another company, so I picked what I thought went together. 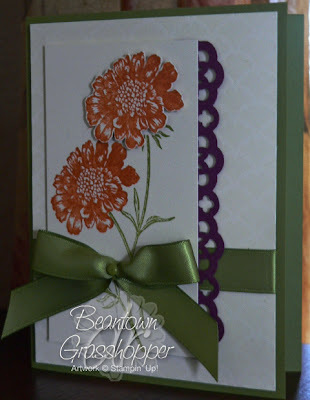 On the splotches of color, I used Soft Suede but stamped off on paper before stamping the card. In the past two weeks, I've had two aunts pass away. The first one lost her battle to breast cancer and the most recent one had a gun accident and didn't survive. I keep a stash of cards ready to use and usually don't use them unless I'm short on time. I depleted my stash of sympathy cards and needed to make more for the recent death. This started off as a sympathy and I decided to toss it into my general section. It was the first time I used the fancy fan letterpress and I love the look. Very subtle because I used VersaMark and did it on the bottom layer of the vanilla cardstock. I am so happy to have the opportunity to join this hop. Being military and having experienced deployments and knowing first hand how happy everyone is on both ends when mail is received, this makes my heart happy. I haven't been stamping lately but I'm jumping back in and taking time to enjoy the little things, which includes stamping. I'm thinking by now you know what OWH is about, but just in case, people send them cards for holidays, birthdays, anniversaries, etc. They (OWH) package them up and send them overseas so the military can use them to send greetings to their family. Another way to stay connected.